M’s shirt was a colossal fail for me, mainly because I was urged to purchase the incorrect size and I didn’t know how to size down. He’ll never wear it, the button holes are too far from the edge and the shirt is just too tight. The interfacing on the collar is too stiff and the facings are huge. I know this pattern has had rave reviews but I will never make it again. I’m exhausted and hate that darn shirt! I bought the book, “Pattern Fitting with Confidence” by Nancy Zieman and can see my greatest error in hacking off 2 inches from both front pieces as well as either side of the back. 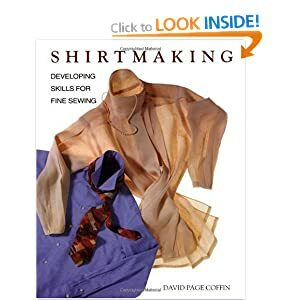 “Shirtmaking” by David Coffin is in transit, I should have it by Monday. That big glass of merlot is going down nicely.